(0 Customer Reviews) | Write Review 12 issues per year Woman’s Weekly Fiction Special is a monthly collection of 20 stories by some of the very best writers, all hand-picked by the team at Woman’s Weekly magazine. Fiction Special aims to provide varied, entertaining and relaxing reads, in a wide range of lengths from five-minute stories to much longer ones you can lose yourself in. You’ll find all kinds of themes from romantic love to mystery, suspense and the occasional ghost story, plus stories to make you laugh and cry, all wrapped up in the trademark Woman’s Weekly warmth and representing hours of good-value reading. 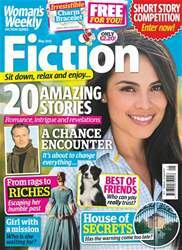 You'll receive 12 issues during a 1 year Womans Weekly Fiction Special magazine subscription. You'll receive 12 issues during a 1 year Womans Weekly Fiction Special magazine print subscription.